This is the ninth of my “Advent Calendar” Christmas ornament posts. For some background information about this project and why I’m challenging myself to complete it, see here. Note: it’s entirely possible some of these memories are inexact, but I’m sticking with them anyway. 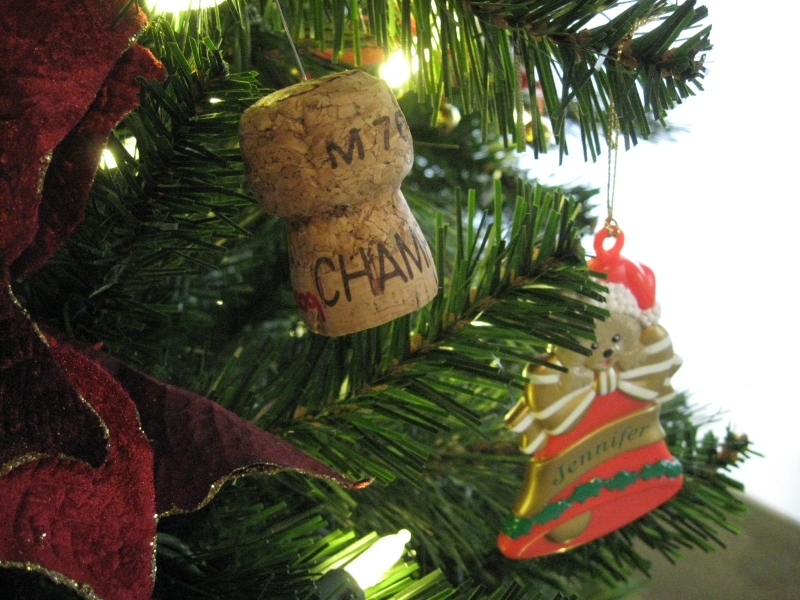 This champagne cork is from February 14th, 2009. We had something to celebrate. I held Dave’s present behind my back. I don’t know why I bothered, because he was still in the bathroom, getting dressed after his shower, and he couldn’t possibly see it yet. I waited, sitting at the foot of Mom’s bed with my legs hanging over the side. She always took the couch and let us sleep in her bed when we visited, and didn’t split up the unmarried cohabitating sinners by making Dave sleep in another room. She knew he wasn’t just some guy I kept bringing over, and I was grateful for that. He came in, closed the door quietly behind him, and stood at the mirror to brush his hair into place. I watched him. Mirror-Dave caught me watching, and smiled. When he turned to me, I brought my hand around and handed him his present – a small photo book I’d put together. With hours of care and effort, I’d assembled a photo timeline of our whole relationship to that point, from our first email exchange to the latest event we’d attended together. I’d called it “The Book of Dave and Jen”. At the last moment, before sending the final version to be printed, I had taken a deep breath and added “(volume 1)” to the title. I had worried a little that I might be tempting fate, but it was done and stayed done. I held my breath as he looked at it. He flipped through a few pages, looked at a few pictures. That was it? I wanted to take a minute to look through it with him, to talk about the moments I’d included, to reminisce about all our adventures and how much we’d done together! I wanted acknowledgement of all the work and mushy romantic thinking that went into it! But he was distracted. Preoccupied. He put the book down on the bed beside me. He put a hand in his pocket. He left it there, and took a deep breath. “We’ve known each other for 4 years now, and I can’t imagine my life without you.” He took his hand from his pocket and opened up a small velvet box to show me a delicate ring. “Will you marry me?” So very simple. No speeches, no fireworks, just a man with a question and his mother’s ring in a velvet box. My eyes danced between his hopeful expression and the little box he held out in front of him. I was entirely unprepared for what was happening. I’d been hoping, for months, that he’d finally make up his mind and ask me, but I didn’t expect it to be here. In my Mom’s bedroom. On Valentine’s Day. Before breakfast. He didn’t respond immediately, so in the quiet bewilderment of the moment, I said it again. I stood up and wrapped my arms around him. This entry was posted in Uncategorized on December 9, 2012 by antijen.